mark 4. Line a baking sheet with non-stick baking parchment. 2. Toss the pecans in a bowl with the icing sugar and signature spice mix, add 1 tbsp water and stir until the nuts are coated. Tip onto the prepared tray and roast in the oven for 5 minutes until golden. Remove from the oven, be aware they will crisp up on cooling, and set aside. 3. Place the fruit slices in a shallow bowl along with any juice. In a saucepan, gently heat the sugar with 50ml water until golden and caramelised. Stir in the vanilla essence, then pour the sugar mixture over the fruit and set aside in the fridge for at least 30 minutes. 4. 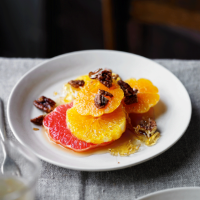 Serve the caramelised fruit with the candied pecans sprinkled over.